Having positioned itself to rule the future of virtual reality, Facebook is now staking its flag in the ground for AR. At Facebook's 2017 F8 Conference, Mark Zuckerberg announced the Camera Effects Platform, a place for developers to build augmented reality experiences into the company's in-app cameras. Also, you're struggling to tell the difference between this and the World Lenses feature Snapchat announced just hours before, you're not the only one. That timing was probably no coincidence. You're also not alone if you thought some of the AR use cases Facebook showed off felt a bit... vapid. But others, like overlaying information onto real-world locations (pour another one out for Google Glass) point to more valuable applications. More importantly though, as Zuck himself alluded, this is just Phase One of a much bigger push into our augmented/mixed reality future, where Facebook will be competing with Apple, Snap, Google and other yet-unknown entities. It's a future in which our smartphones don't belong - at least not for AR. Smartglasses haven't taken off because the technology just isn't good enough for augmented reality. The smartphone is - for now - but it's also the catalyst to its own descent. Have no doubt that Facebook is building towards head-worn technology, but until then the smartphone is the way to take AR mainstream. "We all know where we want this to get eventually," Zuckerberg said at F8. "We want glasses or eventually contact lenses that look and feel normal, but let us overlay all kinds of information and digital objects on top of the real world." By the way, this isn't the first time Zuck has made his ambitions for smartglasses known. Two months back we reported that he was teasing some development from inside the Oculus research lab. Wrote Zuck: "The goal is to make VR and AR what we all want it to be: glasses small enough to take anywhere, software that lets you experience anything, and technology that lets you interact with the virtual world just like you do with the physical one." 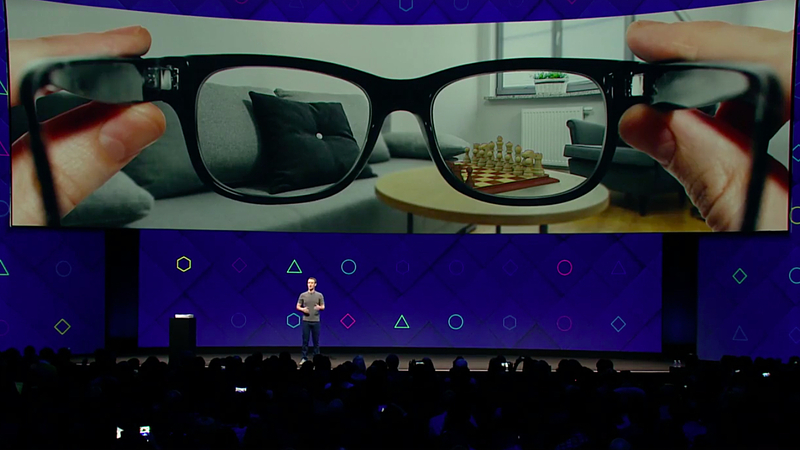 At F8, Zuckerberg gave an example of playing chess with a friend far away, via the power of mixed reality. In this scenario, the smartphone is pretty much redundant. After all, why would you want to hold up a smartphone to play a game on your living room table? But also interesting in all of this is that Snapchat is moving fast in the same direction, and I expect Facebook's announcement will only spur Evan Spiegel to quicken the pace on its own hardware development. Last year the company acquired Israeli AR startup Cimagine, hinting at what may be to come for the next phase of Snap Spectacles. It could very well bring its new World Lenses feature to the next pair of glasses. Facebook and Snap are both primarily software companies, which makes their AR play more unique and, arguably, stronger. There was a lot of thirst for the first-gen Snap Specs, which was largely down to the company having an established and popular platform already in place (a dollop of artificial scarcity helped too). It may be a few years until we see Facebook launch any AR hardware, but if you think any of this is enough to destroy Snapchat, I think you're crazy. They're not the only ones betting big on AR of course. Microsoft and Magic Leap are doing it. Apple is said to be doing it. We expect Google will return with Glass 2 eventually. Tech is catching up with bigger ideas, but Facebook has just laid some major groundwork for a future where AR exists not on our phones, but on our faces.